2 EnglishPolish Hello!Dzień dobry! Hi!Cześć! How are you doing?Jak leci? Pleased to meet you!Miło cię poznać! PleaseProszę Thank you!Dziękuję! Youre welcomeProszę bardzo Sorry!Przepraszam How can I help you?Jak mogę Panu/ Pani pomóc? 3 EnglishPolish See you later !Na razie! Bye!Pa! I dont understand.Nie rozumiem. Can you repeat, please?Proszę powtórzyć. I really like Poland.Bardzo lubię Polskę. WelcomeWitam Do you speak English?Mówi Pan/ Pani po angielsku? Where do you come from?Skąd pochodzisz? I come from …Pochodzę z …. 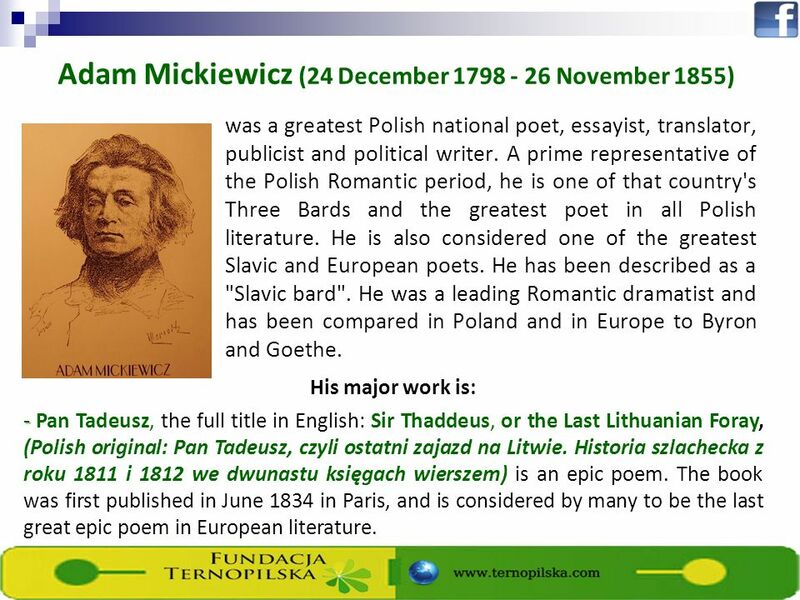 4 Adam Mickiewicz (24 December 1798 - 26 November 1855) was a greatest Polish national poet, essayist, translator, publicist and political writer. A prime representative of the Polish Romantic period, he is one of that country's Three Bards and the greatest poet in all Polish literature. He is also considered one of the greatest Slavic and European poets. He has been described as a "Slavic bard". He was a leading Romantic dramatist and has been compared in Poland and in Europe to Byron and Goethe. His major work is: - - Pan Tadeusz, the full title in English: Sir Thaddeus, or the Last Lithuanian Foray, (Polish original: Pan Tadeusz, czyli ostatni zajazd na Litwie. Historia szlachecka z roku 1811 i 1812 we dwunastu księgach wierszem) is an epic poem. The book was first published in June 1834 in Paris, and is considered by many to be the last great epic poem in European literature. 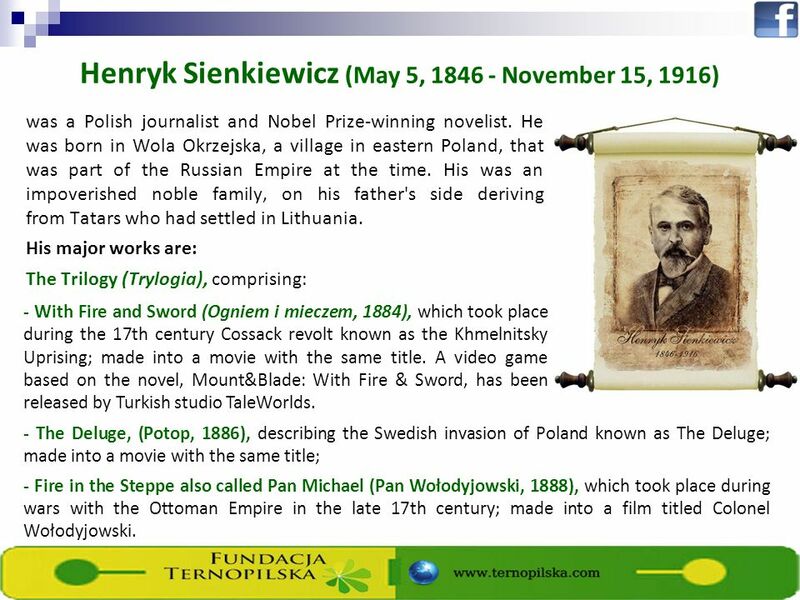 5 Henryk Sienkiewicz (May 5, 1846 - November 15, 1916) was a Polish journalist and Nobel Prize-winning novelist. He was born in Wola Okrzejska, a village in eastern Poland, that was part of the Russian Empire at the time. His was an impoverished noble family, on his father's side deriving from Tatars who had settled in Lithuania. His major works are: The Trilogy (Trylogia), comprising: - The Deluge, (Potop, 1886), describing the Swedish invasion of Poland known as The Deluge; made into a movie with the same title; - Fire in the Steppe also called Pan Michael (Pan Wołodyjowski, 1888), which took place during wars with the Ottoman Empire in the late 17th century; made into a film titled Colonel Wołodyjowski. - With Fire and Sword (Ogniem i mieczem, 1884), which took place during the 17th century Cossack revolt known as the Khmelnitsky Uprising; made into a movie with the same title. A video game based on the novel, Mount&Blade: With Fire & Sword, has been released by Turkish studio TaleWorlds. 6 Władysław Stanisław Reymont (Kobiele Wielkie, May 7, 1867 – December 5, 1925, Warsaw) was a Polish novelist and the 1924 laureate of the Nobel Prize in Literature. His best-known work is the award-winning four-volume novel Chłopi (The Peasants). Reymont's baptism certificate lists his original surname as Stanisław Władysław Rejment. The change of name from "Rejment" to "Reymont" was made by the author himself during his publishing debut, as it was supposed to protect him, in the Russian part of Poland, from any potential trouble for having already published in Galicia a work not allowed under the Tsar's censorship. His major work is: - The Peasansts, (Chłopi). 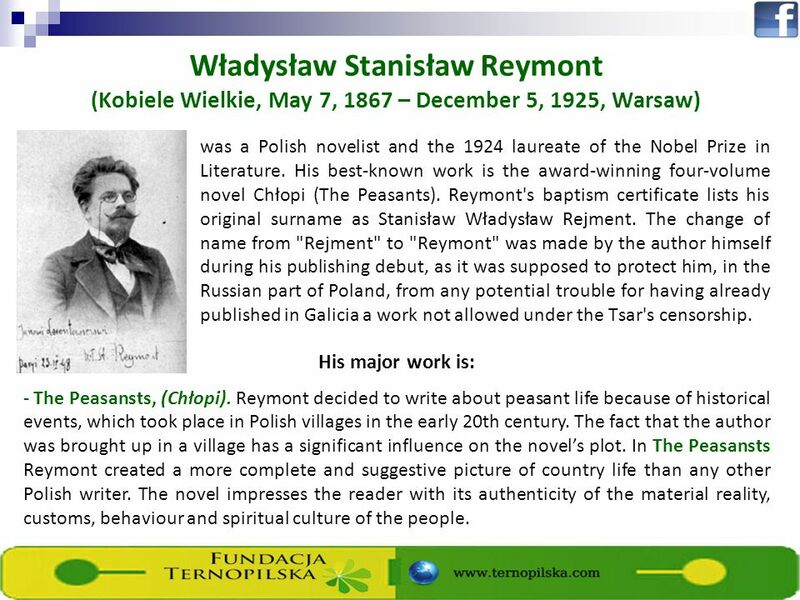 Reymont decided to write about peasant life because of historical events, which took place in Polish villages in the early 20th century. The fact that the author was brought up in a village has a significant influence on the novels plot. In The Peasansts Reymont created a more complete and suggestive picture of country life than any other Polish writer. The novel impresses the reader with its authenticity of the material reality, customs, behaviour and spiritual culture of the people. 7 Wisława Szymborska-Włodek (2 July 1923 - 1 February 2012) was a Polish poet, essayist, translator and recipient of the 1996 Nobel Prize in Literature. Born in Prowent, which has since become part of Kórnik, she later resided in Kraków until the end of her life. She was described as a "Mozart of Poetry". 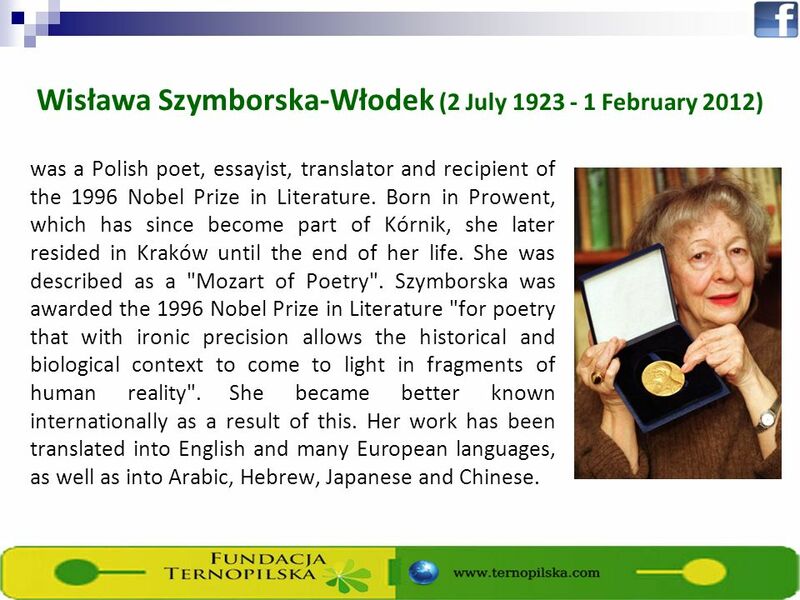 Szymborska was awarded the 1996 Nobel Prize in Literature "for poetry that with ironic precision allows the historical and biological context to come to light in fragments of human reality". She became better known internationally as a result of this. Her work has been translated into English and many European languages, as well as into Arabic, Hebrew, Japanese and Chinese. Download ppt "EnglishPolish Hello!Dzień dobry! Hi!Cześć! How are you doing?Jak leci? Pleased to meet you!Miło cię poznać! PleaseProszę Thank you!Dziękuję! Youre welcomeProszę"
Polish writer Henryk Sienkiewicz Nobel prize winner. Wislawa Szymborska. She was born in Kornik in Western Poland on 2 July Since 1931 she has been living in Krakow,where during she studied. Polish is a language of the Lechitic subgroup of West Slavic languages, used throughout Poland (being that country's official language) and by Polish. Famous Poles Presentation by Polish Participants Sopot 2011 English Unlimited Discover the World Anew Project 2010/2011. (ur. 4 June 1952 in Obornikach Śląskich) Polish politician, a trained historian, on August 6, 2010 President of the Polish Republic. POLISH LITERATURE The first Polish literary works come from the 10th century. The most significant texts of that time were chronicles, written in Latin. My favourite book Author : Ola Kłosowska. The book I am describing is entitled ‘In Desert and Wilderness’ and was written by Henryk Sienkiewicz. The story. TARKAN He is the most famous singer of Turkey. He has beautiful songs and beautiful voice. John Steinbeck One of our great California writers. Author: Magdalena Wojcik. PL Flag Coat of arms. W.B. Yeats ( ) ► Poet, dramatist, mystic, essayist, critic. ► Widely considered to be one of the greatest English-language poets of the 20th century. Anna Niżegorodcew English Department Jagiellonian University, Kraków, Poland. Imagining Mickiewicz as a National Poet From the Non-National past to the Nationally Delimited Present Literature and Union, University of Glasgow, Nov.
(24 December 1798 – 26 November 1855) was a Polish poet, dramatist, essayist, publicist, translator, professor of Slavic literature, and political activist. Henryk Sienkiewicz was a Polish writer, journalist and philanthropist. He is best known for his historical novels, many of which have been adapted into. eTwinning project 2012/13 Future Generation Photography as a Pedagogical Tool.